After a drought, we had a three-time champ last week; we might be minting another tonight. Looking for #3, Jose lost his lead on the very last clue of Double Jeopardy!. Thomas took the lead on a $400 clue. It’s been unusual as of late to see a low-value clue go last; few players have embraced the Forrest Bounce, but it (barely) led to a lead for Thomas this evening. If Jose doubles his score, he’ll have 25,600. 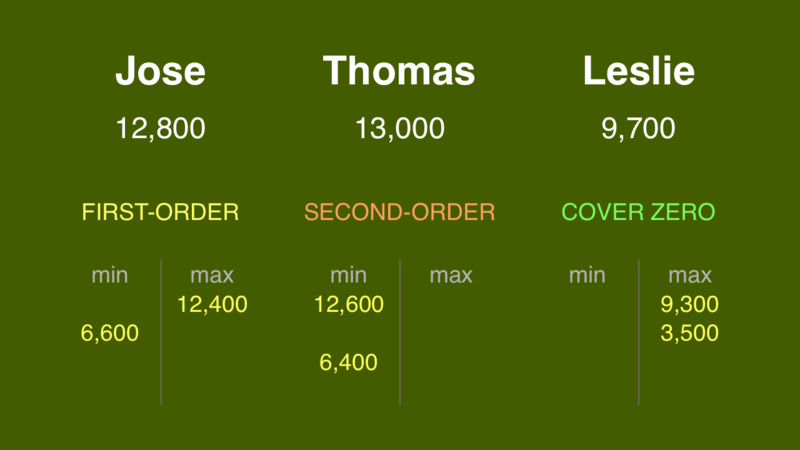 To cover this all-in wager, Thomas will need to wager 12,600. An incorrect response with that wager will leave Thomas with 400. To stay above his total, Jose can wager up to 12,400. Leslie can wager up to 9,300. A successful doubling will put Leslie at 19,400. To cover this, Jose should wager at least 6,600. If Jose is wrong with that wager, Leslie could beat him by capping hers at 3,500. Jose and Thomas are so close that there are really no mind-game considerations between them. Were Leslie not a factor, Thomas could choose between (1) covering Jose’s double and (2) wagering 199 to force Jose to respond correctly – a Colbyesque wager (and, in fact, the same amount). 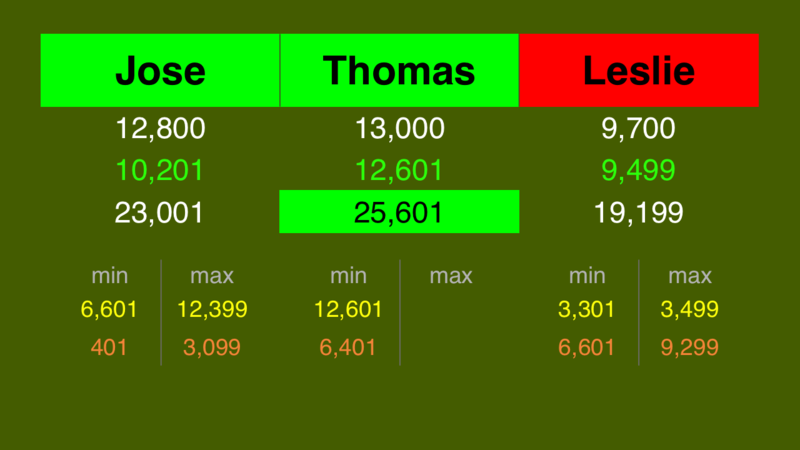 But since Leslie can overtake Thomas, Thomas has almost no choice but to go for broke. Jose can bet just 400 to cover both (1) that Colbyesque wager out of Thomas and (2) the rational 3,500 maximum from Leslie. Leslie does have a higher range, too, but is much riskier against Jose. This was the first time in 33 games that all three players responded correctly on Final. I write about that streak in this week’s By the Numbers entry. Color me confused by Jose’s wager: did he think Thomas would go for 10,000 even? 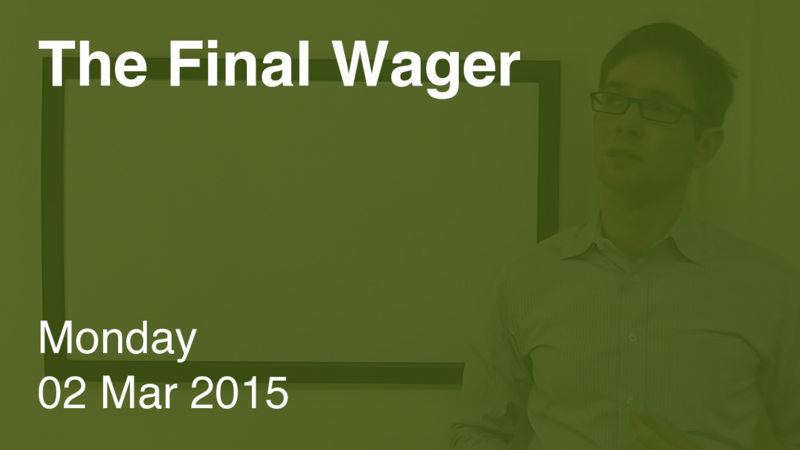 I’d be somewhat confident that a player bouncing around like Arthur Chu knows how to wager properly. Leslie made a calculation error. 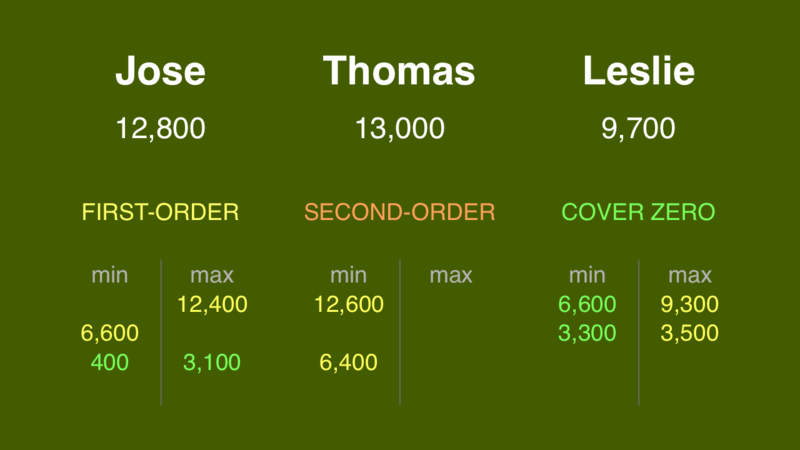 Thomas and Jose are separated by 200, but if Thomas goes for the lockout wager and misses, he’ll have twice that – 400 – remaining (399 if he adds the dollar). Thomas looks like a promising player. We’ll see what he does tomorrow!